Judge Kiesha R. Storey serves as the Judge in Division A of the DeKalb County State Court- Traffic Division. Judge Storey is from Gainesville, Georgia, where she graduated from Gainesville High School in 1993. She is a first generation college graduate, having received her Bachelor of Arts in Psychology from Spelman College in 1997. She went on to attend Emory University School of Law, where she received her Juris Doctorate in 2000. After becoming a member of the State Bar of Georgia in November of 2000, Judge Storey practiced for a short time in personal injury and workers’ compensation law before entering public service as an Assistant District Attorney for the Northeastern Judicial Circuit. During her tenure, she prosecuted thousands of felony and misdemeanor offenses, served on the Drug Prosecution team, and served as one of the prosecutors for the Hall County Drug Court Program. In 2005, Judge Storey left the District Attorney’s office and opened her own law office where she focused her practice primarily on criminal defense, domestic relations, and civil litigation. Judge Storey engaged in the private practice of law for five years, and served as a zealous advocate for indigent and retained clients. Always a public servant, she also served during this time period, as the Solicitor for the Town of Braselton (prosecuting misdemeanor traffic offenses and ordinance violations), the Deputy Solicitor for the City of Gainesville, the Public Defender for Flowery Branch Municipal Court, and the Defense Attorney for the Hall County Felony Drug Court Program and the Dawson County Hybrid Drug and DUI Court Program of which she was a founding team member. In May 2010, Judge Storey returned to prosecution full-time as an Assistant Solicitor-General in the Office of the DeKalb County Solicitor-General. She was quickly promoted to create and lead the Diversion and Community Alternative Programs Unit as that unit’s first Deputy Chief Assistant Solicitor –General. She received recognition from the Prosecuting Attorneys Council of Georgia as the Assistant Solicitor-General of the Year in 2014 for her work in that unit. 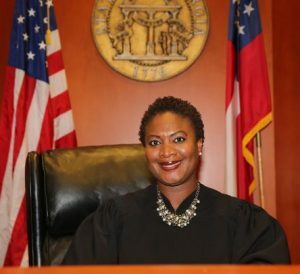 She also served as the Southeast Regional Director of the National Black Prosecutors Association from 2014 until Governor Nathan Deal appointed her to the DeKalb County State Court- Traffic Division as Associate Judge on July 30, 2015. On May 24, 2016, Judge Storey ran unopposed and was elected by the citizens of DeKalb County to continue serving as Associate Judge for Division A of the DeKalb County State Court – Traffic Division. Judge Storey has always been very active in her community, with the State Bar, and other bar associations. She has served on six nonprofit boards, and has been a member of a number of Task Force Committees in DeKalb County, including the DeKalb County Reentry and Recidivism Task Force. Some, but not all, of her current memberships include Junior League of DeKalb County, Leadership DeKalb, DeKalb Bar Association, DeKalb Lawyers Association, Georgia Association of Black Women Attorneys; and she serves as a Member at Large/ Board of Directors member of the Gate City Bar Association-Judicial Section. Judge Storey and her family are proud to call the Eastlake Community in DeKalb County home.